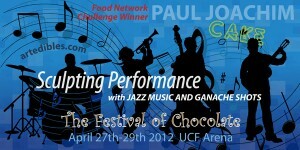 Paul Joachim will be sculpting live at the Festival of Chocolate this Friday-Sunday. Come relax in jetBlue’s Chill Lounge, drink chocolate martini’s, enjoy ganache shots, listen to jazz and watch me create a life-size saxophone musician cake. The event is at UCF’s Arena.